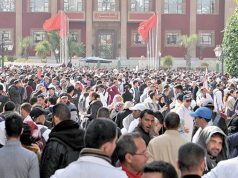 Unions organized three days of contractual teacher protests in Rabat to keep pressure on the government to meet their demands. Mohammed Kassimi leads chants in front of Parliament during the second week of Morocco's contractual teachers' protests in April. Photo by Anton L. Delgado/Morocco World News. 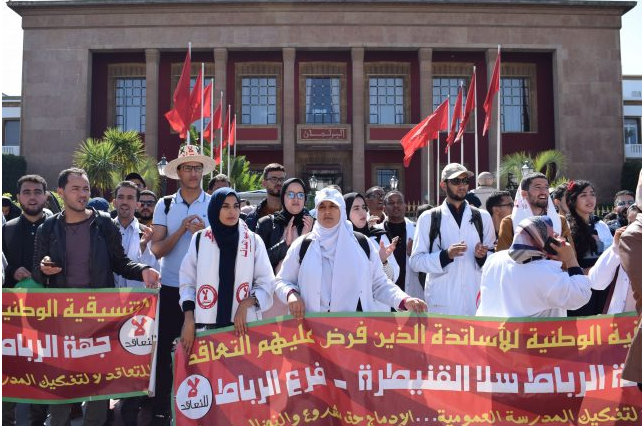 Rabat – Dozens of contractual teachers are back on the streets beginning a three-day strike in protest of the government’s refusal to meet their demands. The strike, planned to take place from April 8 to 10, was organized by the Coordination of Teachers Forced into Contracts (CNPCC). It is in response to the Ministry of Education’s threats to dismiss teachers and cut pay if they do not return to their jobs. The threats have only led to unions promising to double their protesting efforts, some going as far as to claim they will continue to strike for the rest of the year. The three-day strike marks the second week of demonstrations in April—the current round of protests began in February. The contractual teachers are protesting the government’s refusal to eliminate the use of annual contracts. The documents give contractual teachers the same salary as teachers permanently on the government payroll, but offer a smaller pension and less job security, which are the two main reasons many have been protesting. Njakh spent 13 years teaching in a private school before becoming a contractual teacher, a transition he says was incredibly difficult. “There is no comparison between the two jobs, being a contractual teacher is so much worse,” Njakh said. He later mentioned the difference of job security, pension, supplies, infrastructure, and treatment. Despite the continued protests, the Ministry of Education has remained resolute in its decision to avoid giving in to all of the contractual teachers’ demands. 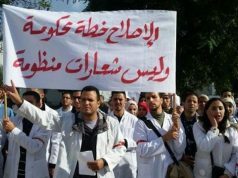 At the end of March, Minister of Education Said Amzazi announced the government’s plans to begin firing contractual teacher protestors. 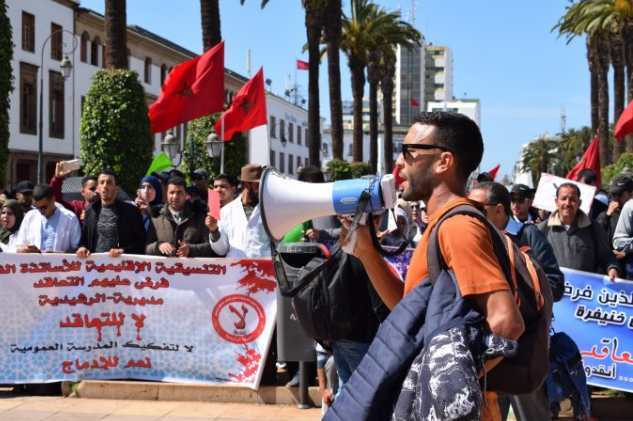 After receiving a warning letter last week stating that his contract would be terminated if he continued protesting, Nabril Chamssi took the nearly 700-kilometer trip from Sidi Ifni north along the Atlantic coast to Rabat to take part in this week’s protest. 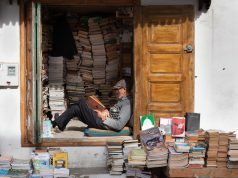 The 28-year-old English teacher was accompanied by more than 150 of his colleagues from Sidi Ifni—many of them having received the same warning. 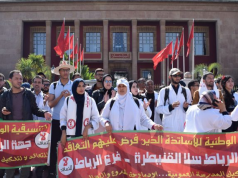 “I felt terrible receiving that letter because I’ve spent years studying and have put so much effort into teaching and now here they are telling us that we have to either work under terrible or conditions or be unemployed,” Chamssi told Morocco World News. 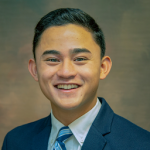 Chamssi has less than 60 days to return to the classroom before his contract is terminated. But the looming deadline has done nothing to stop Chamssi.